Aluminum 10-Qt. Pot with Basket .Used for Fish Fry. Aluminum 120-Qt. Boiler with Basket and Vented Lid. 99% Pure Restaurant Grade Aluminum. Aluminum 14-Qt. Pot with Basket and Lid.Used for Fish Fry. Aluminum 160-Qt. Boiler with Basket and Vented Lid. 99% Pure Restaurant Grade Aluminum. Aluminum 20-Qt. 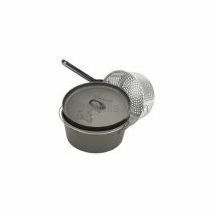 Stockpot with Small Holed Basket. Great for Pasta and such. 99% Restaurant Grade Aluminum. Aluminum24-Qt. 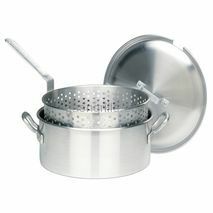 Fryer or Steamer with Basket and Lid.Basket Sits 3" Above Bottom For Steaming. 99% Pure Restaurant Grade Aluminum. Aluminum 34-Qt. 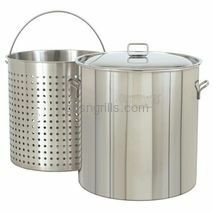 Fryer or Steamer with Basket and Lid.Basket Sits 3" Above Bottom For Steaming. 99% Pure Restaurant Grade Aluminum. Aluminum 42-Qt. 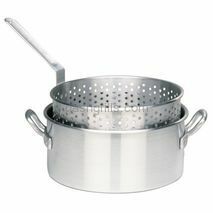 Fryer or Steamer with Basket and Lid.Basket Sits 3" Above Bottom For Steaming. 99% Pure Restaurant Grade Aluminum. Aluminum 60-Qt. 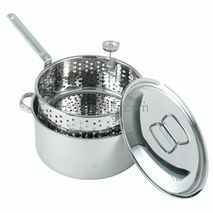 Fryer or Steamer with Basket and Lid.Basket Sits 3" Above Bottom For Steaming. 99% Pure Restaurant Grade Aluminum. Aluminum 80-Qt. Boiler with Basket and Vented Lid. 99% Pure Restaurant Grade Aluminum. Cast Iron 8.5-Qt. Dutch Oven with Basket and Lid. Heavy Duty 32-Qt Aluminum Deep Fryer with Lid. 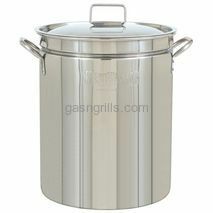 Stainless Steel 10-Qt. Pot with Basket and Lid .Used for Fish Fry. 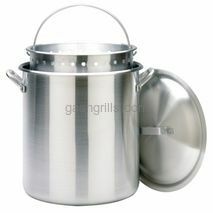 102-Qt Stainless Steel Pot with Lid Only for Boiling, Frying or Steaming for Indoor and Outdoor uses. 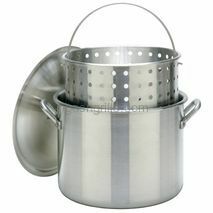 102-Qt Stainless Steel Pot and Basket for Boiling, Frying or Steaming for Indoor and Outdoor uses. 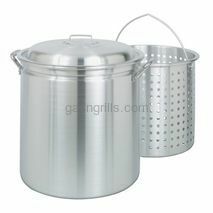 122-Qt Stainless Steel Pot with Lid Only for Boiling, Frying or Steaming for Indoor and Outdoor uses. 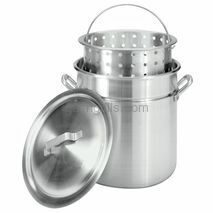 122-Qt Stainless Steel Pot and Basket for Boiling, Frying or Steaming for Indoor and Outdoor uses. 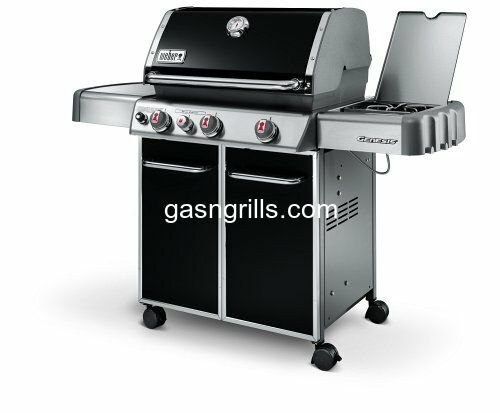 Stainless Steel 14-Qt. Pot with Basket and Lid .Used for Fish Fry. 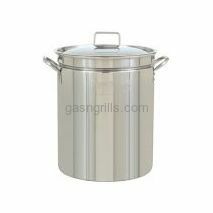 142-Qt Stainless Steel Pot with Lid Only for Boiling, Frying or Steaming for Indoor and Outdoor uses. 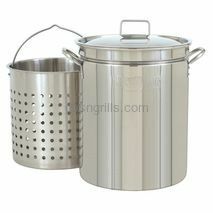 142-Qt Stainless Steel Pot and Basket for Boiling, Frying or Steaming for Indoor and Outdoor uses. 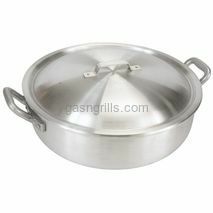 162-Qt Stainless Steel Pot with Lid Only for Boiling, Frying or Steaming for Indoor and Outdoor uses. 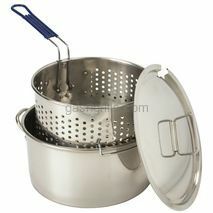 162-Qt Stainless Steel Pot and Basket for Boiling, Frying or Steaming for Indoor and Outdoor uses. 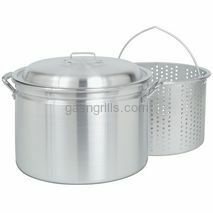 24-Qt Stainless Steel Pot with Lid Only for Boiling, Frying or Steaming for Indoor and Outdoor uses. 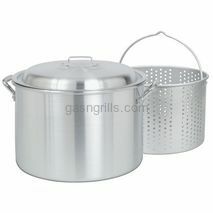 24-Qt Stainless Steel Pot and Basket for Boiling, Frying or Steaming for Indoor and Outdoor uses.